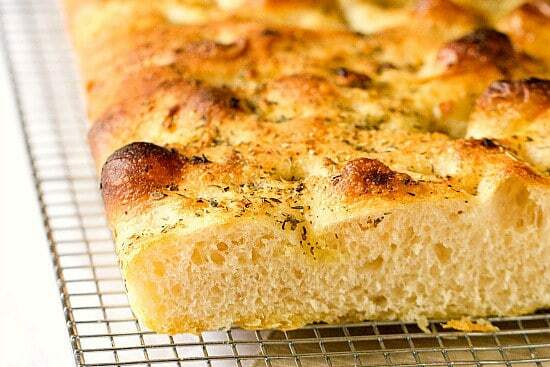 One of my favorite store-bought (or, I suppose, bakery-bought) splurges is focaccia bread. 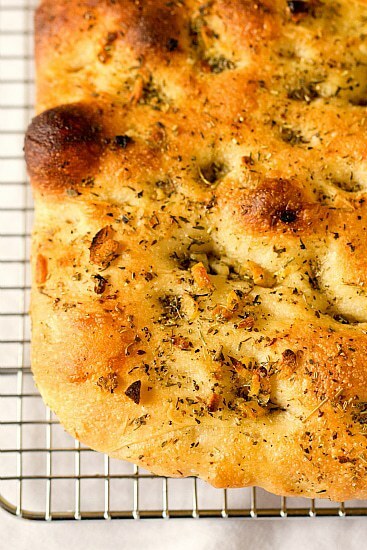 The crusty outside, chewy interior, and all of the flavors from herbs and garlic. When there’s a loaf in the house I’m guilty of cutting off a piece (just a little piece! ), and then another piece, and then another, and then of course I have to even the row and eat another one. I just can’t stop myself; focaccia might the worst of my savory vices. Next to pizza, of course ;-) Who can stop at just one piece?! 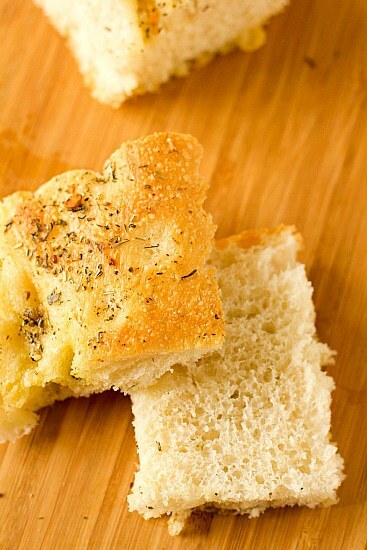 So needless to say, it was high-time that I made focaccia myself and kick the store-bought loaves to the curb. I have had this page doggie-eared in The Bread Baker’s Apprentice since I bought the book nearly 5 years ago. I have no idea what took me so darn long to make this bread, but I could kick myself for not making it 5 years sooner. There is a lot of inactive time when making this bread – stretching, folding, and resting, then more stretching, folding and resting. Then there is an overnight rise in the refrigerator. Then a 3-hour rise the day you are baking the bread. A lot of waiting. But oh is it worth the wait. The smell of this bread baking was simply intoxicating. 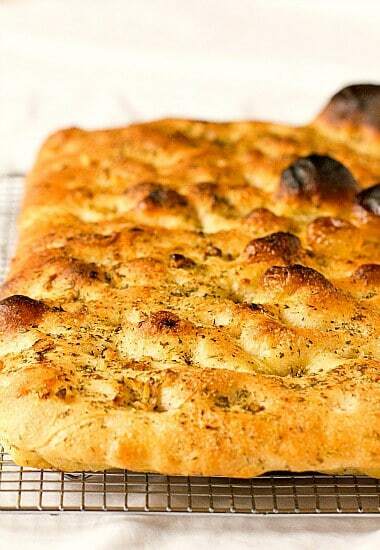 Bread dough, herbs, garlic… amazing. Making the bread itself is not very complicated at all. A short mix of ingredients to form the dough, then kneading, and then as I mentioned above, some stretching and folding, but it takes just a few minutes each time. 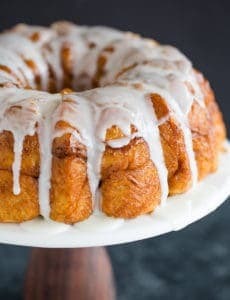 It’s totally doable and a very forgiving recipe. 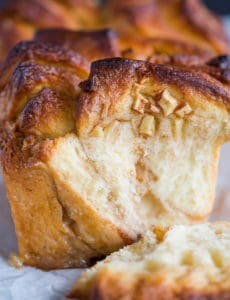 You’ll feel like an Italian artisan bread maker when this comes out of the oven! You’ll notice that my focaccia looks a little high compared to the usual loaves that you see. 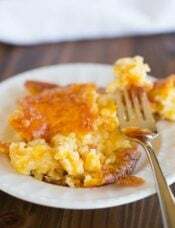 The reason for that is the largest pan I have that can fit into my oven is a 10×15-inch, which is a bit smaller than the 12×17-inch pan that the recipes calls for. Since the dough couldn’t spread out horizontally anymore, it naturally went up. Which turned out to be wonderful, actually. The interior crumb was light and spongy, soft and delicious. And a bonus – you can slice the bread in half horizontally and use it to make a sandwich! I can only imagine what an insanely delicious panini this could make with a pesto spread, Asiago cheese and some type of Italian lunchmeat. It took me until the middle of January, but now I’m rolling on another one of my resolutions for 2012 – more homemade bread! Mixing the dough, the smell of yeast, the soft dough in my hands, watching it rise and bubble, and then that priceless smell. 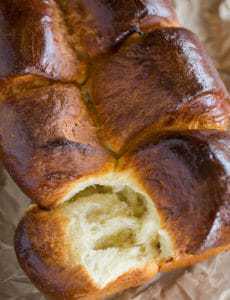 Homemade bread in the oven – it can transform a kitchen. I’m happy to be back on the wagon and plan to make bread baking a weekly practice in the kitchen, so stay tuned for more fun recipes! 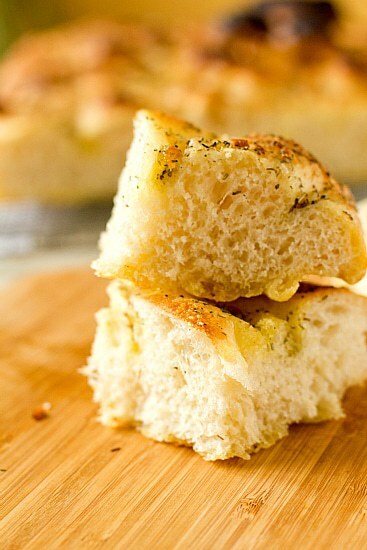 I’ve tried several focaccia recipes over the years. This is my favorite. How much oil do I add in step 2? 6 tablespoons ? I made this EXACTLY as is and it turned out amazing. 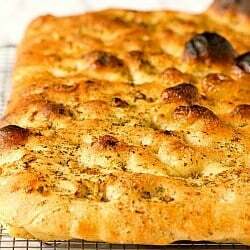 My fiancee grew up in Milan and was craving good old fashioned focaccia and this recipe really seemed to hit the spot. Will definitely make again!